In the wake of the bloody fighting around Monterrey, Mexico on Sept. 21, 1846 “a cold, chilly rain” began to fall on the combatants. As soldiers scurried for cover to get out of the deluge, Maj. Gen. Zachary Taylor sought to continue his advance against the city that extracted blood for every step taken. The columns Taylor had sent straight into Monterrey on Sept. 21 were in no way ready to continue the fighting on Sept. 22—still recovering from the appalling losses to both officers and enlisted men. That left Brig. 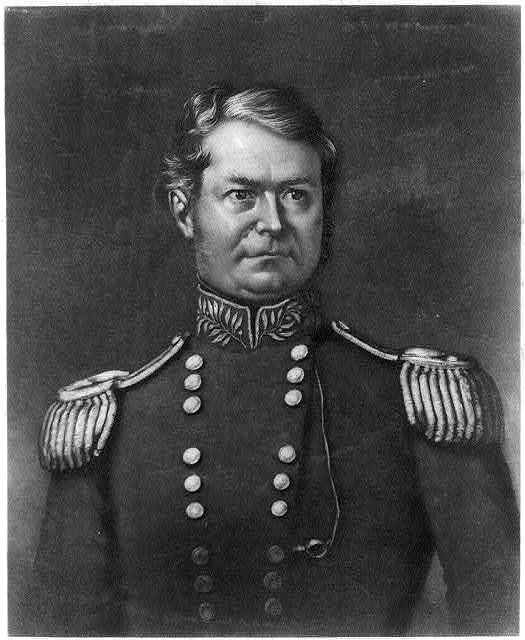 Gen. William J. Worth, whose division had captured Federation Hill the day before with few casualties. The action on September 22 would focus entirely on what Worth could accomplish. 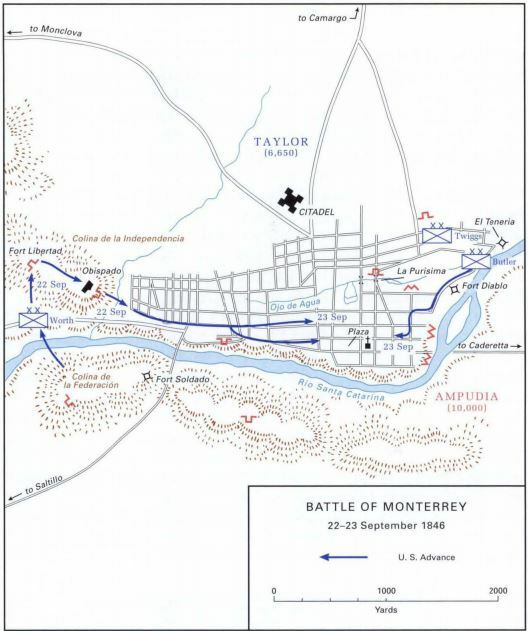 Separated from Taylor, it fell to Worth to make the strategic and tactical decisions that would help the American army get into Monterrey. From their recently-captured position at Federation Hill, the American soldiers were in cannon range from a second prominent knoll, Independence Hill. Atop Independence Hill sat the Fort Libertad, occupied by about 80 Mexican infantrymen. On the other side of Independence Hill was the Bishop’s Palace, or Palacio del Obispado, which controlled the western approaches to Monterrey. If American forces were to capture the city, both Fort Libertad and the Bishop’s Palace had to fall. To mitigate some of those losses, Worth planned his attack to start around 3:00 AM on Sept. 22. He handpicked about 500 men, a mixture of US regulars and Texas Rangers, to attack the hill in the dead of the night. Among these men were Company A, 8th US Infantry, commanded by 25-year old Second Lieutenant James Longstreet. The Americans began to ascend the nearly 700-foot slope of Independence Hill, dragging themselves past large rocks and thick thorn bushes. Approaching Fort Libertad in the all-enveloping darkness, the Americans were discovered about 100 yards from their objective. Mexican muskets began to bang away into the black morning, but most of the shots went overhead. Closing into killing range, the Americans pushed the heavily outnumbered Mexicans out of Fort Libertad and sent them streaming towards the Bishop’s Palace. General Worth continued to push his men, ordering the attack continued towards the Bishop’s Palace. That would prove a tougher nut to crack, with some 200 Mexican troops fortified in the palace with loop-holed walls, allowing them to poke their muskets out while staying in the relative safety of the fortress-like structure. The Americans had a plan to deal with the palace, but it required dragging a 12-pounder howitzer up to the recently captured Fort Libertad. “After a good deal of labor,” as written by Lieutenant Napoleon J.T. Dana, the howitzer was positioned behind a low stone wall and began lobbing solid shots at the palace. Those cannonballs blasted the gate wide open to the palace, allowing a breach in. Before the American infantry could advance, however, they had to deal with a Mexican counter-attack. Realizing the strategic significance of Independence Hill, Mexican commanders like Pedro de Ampudia and his subordinates tried desperately to recapture it. With their infantry split between facing Taylor’s columns to the east, and Worth’s men to the west, all they afford to send was a single regiment of cavalry. Those troopers streamed out of the Bishop’s Palace, swords raised high. Because of the rocky sides to Independence Hill, the American infantry were able to find cover before the Mexican charge reached home. And stuck in their grand lines, the Mexican troopers proved easy targets for a concentrated musketry and rifle fire that the Americans poured into them. With saddles emptied by the score, the cavalry retreated back towards the palace, hounded by American soldiers following them the whole way. It was close to 3:00 PM, twelve hours after their initial attack on Fort Libertad, that Worth’s men charged in on the Bishop’s Palace. A crazed melee followed, with both sides locking in hand-to-hand combat for control of the palace. Pouring into the breach made by the howitzer, the Americans soon had the upper hand. 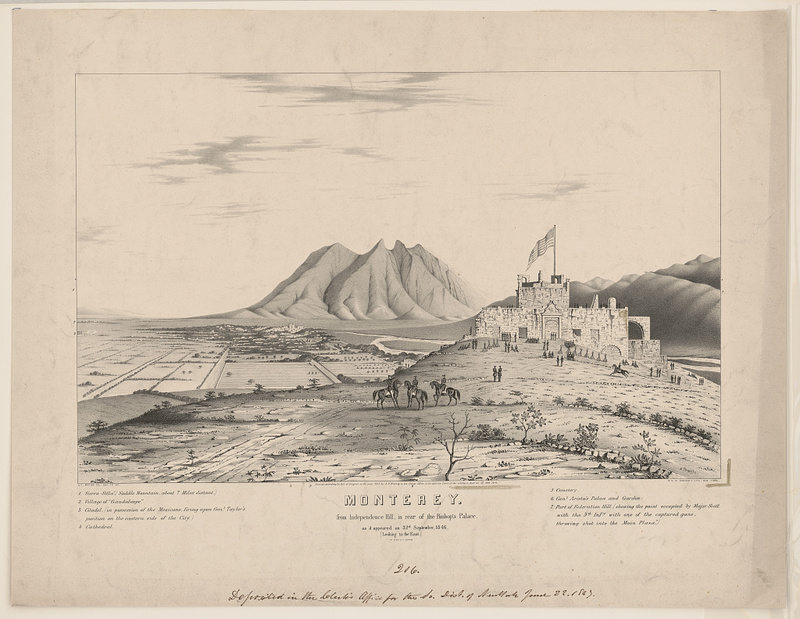 The fighting at the Bishop’s Palace wound down by about 4:00 PM, as the surviving Mexican forces retreated down Independence Hill and into the outskirts of Monterrey. Grabbing the halyard to the palace’s flagpole, American soldiers hauled down the Mexican standard and soon had the Stars and Stripes flying over the Bishop’s Palace. For all his actions on Sept. 22, Worth suffered remarkably light casualties—less than 25. Continuing his lighting strikes from the day before, Worth was able to make quick work of Fort Libertad and then, with concentrated artillery fire, blow the Bishop’s Palace open. Compared with the bloodletting on the eastern approaches of Monterrey the day prior, Worth’s attacks were proving to be the most-successful. His strategic initiative to keep up the attack were keeping pressure mounted on the Mexican high-command charged with defending the city. Had Worth not captured Independence Hill and the Bishop’s Palace, it is unlikely that the American army could have continued operations against Monterrey—at least not without suffering unbearable casualties as they attempted to break into the heart of the city. But, with his western flank gone, General Ampudia, commander of the Mexican forces in the city, decided to fall back. His men retreated into the heart of the city, towards the main plaza. They would make one final stand in the center of Monterrey, hoping to blow the American attackers to pieces as they charged through the grid pattern of the city’s streets. New loopholes were made in the stone houses, and Ampudia waited for the attacks that would win or lose the city. Tomorrow. Daniel Harvey Hill, A Fighter from Way Back: The Mexican War Diary of Lt. Daniel Harvey Hill, 4th Artillery, USA, ed. Nathaniel Cheairs Hughes Jr. and Timothy D. Johnson (Kent, OH: Kent State University Press, 2002),23. Monterrey is Ours! : The Mexican War Letters of Lieutenant Dana, 1845-1847, Edited by Robert H. Ferrell, University Press of Kentucky, 1990,135. 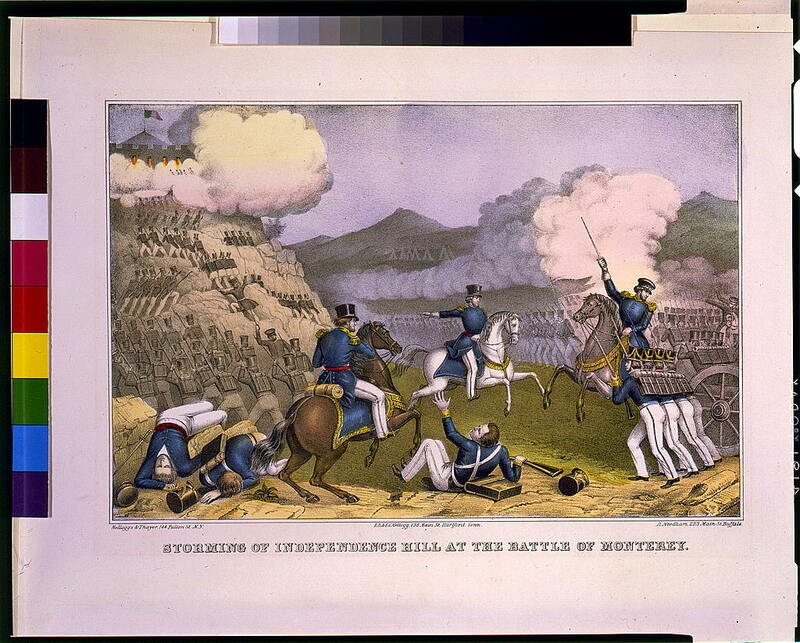 This entry was posted in Armies, Battles, Mexican War and tagged Battle of Monterrey, Bishop's Palace, Fort Libertad, Independence Hill, James Longstreet, Napoleon J.T. Dana, Pedro de Ampudia, William J. Worth, Zachary Taylor. Bookmark the permalink.